So far, Musicars has taken us back to high school and over to imaginary castles, but a common thread between Grease and Chitty Chitty Bang Bang, aside from the memorable cars and unforgettable songs, is the love that builds between the characters. Now, we venture back to the Great Depression for a real romance that grasped America’s attention. Next stop: Bonnie & Clyde. Almost everyone knows the story of the Bonnie and Clyde by now. Whether you think of them as folk heroes, gangster outlaws, or ill-fated lovers, their two-year crime spree consisting of robberies and murders made Bonnie Parker and Clyde Barrow a notorious name in American history. With movies and countless books about them, there is also a musical detailing their journey down infamy road. 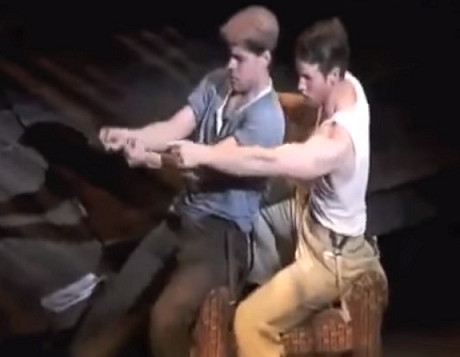 Just as Bonnie and Clyde died young, so did their Broadway run. Premiering first at La Jolla, California in 2009, the show only ran for 69 performances on Broadway in 2011, with a number of international productions since as well. The Bonnie & Clyde musical focuses less on the blood and gore of the tale and more on the love that captivated the two and drove them to a life of crime. The Americana pop/folk/rock/country musical score keeps the show from getting too dark as the legendary outlaws sing their way through the violence and into each other’s hearts (as well as into the history books). 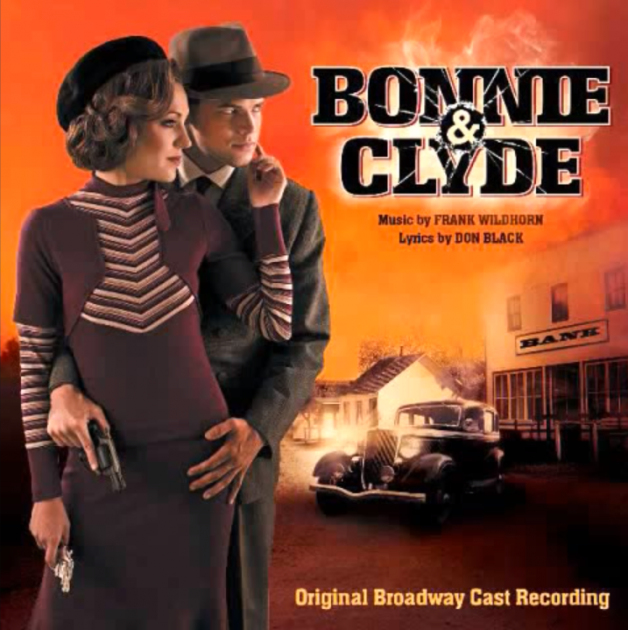 The original Bonnie & Clyde Broadway soundtrack features Jeremy Jordan as Clyde Barrow and Claybourne Elder as Marvin “Buck” Barrow. Jordan’s vocal performance in “When I Drive” is exceptional, full of riffs, high notes, and country twangs, and Elder matches this spirited vigor as a country rock-style instrumental in the back makes the energy in this song contagious. As one would guess, their driving style matches their lifestyle — full of exhilaration, danger, and excitement, often at other people’s expenses. Their preferred driving style consists of driving through town with the pedal down and watching old people jumping. Society would disapprove of such an abhorrent act, which is precisely why they like to add this extra thrill into the elderly’s lives. The brothers imagine escaping the law in the fastest Ford car (a white Model T Roadster reaching 65 mph) while everyone cheers them on. They aspire for greatness, to be “the heroes who the people look up to.” Indeed, they do reach cult hero status, so Clyde ultimately kind of accomplished that dream. Being behind the wheel gives you a sense of liberation when there is nothing in front of you as you leave everything you don’t like (or are trying to avoid) in the dust, which leads into the chorus, “When I drive, when I drive / I’m in love, I’m alive / and I forgot about everything I hate.” I’m sure Clyde hates a lot of things, namely the Texas prison system, so if his Ford can make him forget that, even for a second, that’s quite the feat. Driving gives him the feeling of being able to float and fly, but alas, Clyde’s Ford is not Chitty. Brilliantly, this musical number is full of foreshadowing for the end of Clyde. He loves driving so much, he sings, “This is how I wanna live, I wanna die,” and he demands that we “give [him] a full tank and an open road and watch [him] explode.” Indeed, he gets this wish as well. This upbeat song is a head bopper that makes you temporarily forget Clyde is a federally-wanted criminal. Instead, he’s just a regular human being that loves his car and driving like any other guy. The sheer joy with which he sings the line, “Hey, look at me, I’m drivin’”, paints him as an ebullient boy that is carefree in enjoying life. It’s all about perspective, as Jordan momentarily portrays a man who has been villainized for the past 80 years in a different light, even as the legacy of Bonnie and Clyde striking back against the justice system lives on today. It gives this deadly outlaw, who was only looking for some revenge with his actions, a touch of humanity as he passionately sings about something all Americans love: Ford (or just cars in general). Was Clyde a morally repugnant criminal romanticized by the media and condemned by authorities? Or was he a simple guy who became victim of a system that inevitably changed his view of life? That’s the brilliance of musicals. You decide what’s right. You decide what’s good. In the end, “When I Drive” fully encapsulates how much Clyde admires Ford cars, which is certainly historically accurate. Let us continue. Before we skip ahead to their death, let’s first look at how it all began. 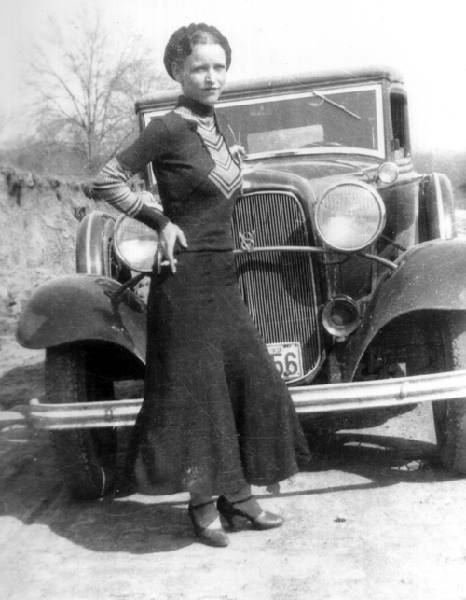 Bonnie Parker, a 20-year-old waitress in Texas, dreams of being a movie star. When her car breaks down on the side of the road, Clyde Barrow, fresh out of jail, stops and helps her repair it. The two fall in love and dream of a famous life ahead together where the world will remember Clyde — and the world certainly does. They plan their escape from their small town Texas life to leave for Dallas as Clyde appeals to Bonnie’s dream of greatness. He says they weren’t born to live and die in Texas. Again, he’s not wrong. Louisiana seems to be the spot for that. 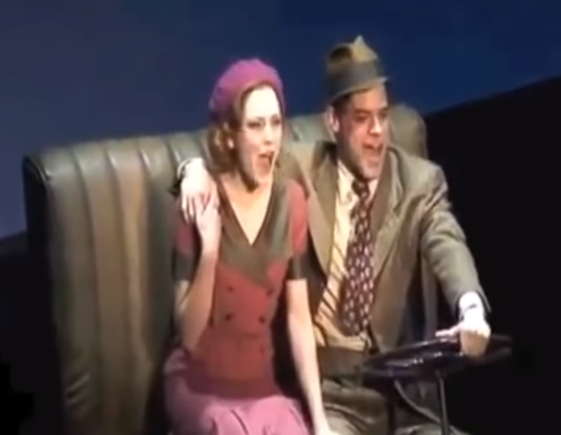 With another fun beat, Jeremy Jordan and Laura Osnes, who plays Bonnie, have strong chemistry as they form that inseparable connection that leads to a fateful end. Some car trouble brings about real trouble, as their story starts on the roadside by a car and ends on the road inside a car. How fitting. Just as “When I Drive” suggests, Clyde’s dream is to live and die in a Ford. He certainly lived his best life in a Ford, just as it is also where he meets his end. Part of the reason Bonnie and Clyde’s reign lasted for so long was because of Clyde’s exceptional driving skills (because they truly were exceptional, as we are all very much aware of now) and the cars he picked. And a man like Clyde only picks the best of the best when it comes to business like evading the police, and that means picking (stealing) a Ford. Their list of borrowed vehicles is long. On one of their criminal sprees in 1933, Bonnie and Clyde stole a 1932 Ford V-8 B-400 convertible coupe that they used during the Joplin hideout raid before abandoning it. Their final stolen vehicle was a 1934 Ford Model 730 Deluxe Sedan. 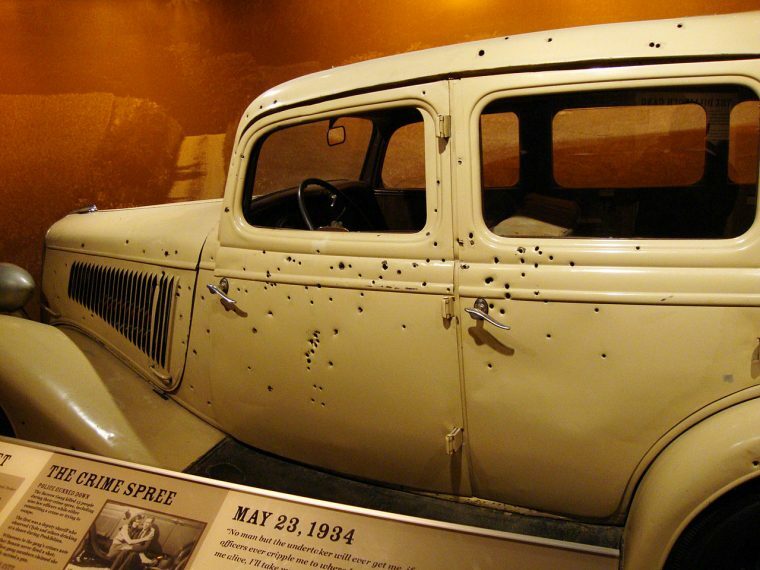 As Bonnie and Clyde drove on a rural Louisiana road in May 1934, the police ambushed them and fired more than 100 rounds into the car, killing the lovers and putting a stop to their grand adventure. Their imminent death couldn’t be more characteristic of Clyde’s wishes however. An ambush shoot out ends his glory run, but that is probably the exit he dreamed of. The infamous, bullet-riddled Ford the duo died in can be seen in a casino in Nevada. Clyde made sure everyone knew about his love for Ford, even the man himself. He’s no different than all those fan girls out there. Clyde Barrow allegedly sent a letter to Henry Ford in April 1934, telling him what a dandy getaway car his Ford V-8s make. With only the utmost respect and admiration for Ford, he says, “For sustained speed and freedom from trouble the Ford has got ever other car skinned and even if my business hasen’t been strickly legal it don’t hurt enything tell you what a fine car you got in the V8.” Though he can’t really spell, he can certainly drive, and driving a Ford is, once again, his favorite. Sent just a month before his famed death in his stolen Ford car, the authenticity of this letter has long been disputed and debated by handwriting analysts and Clyde’s family, based on the handwriting and the “Clyde Champion Barrow” signature. 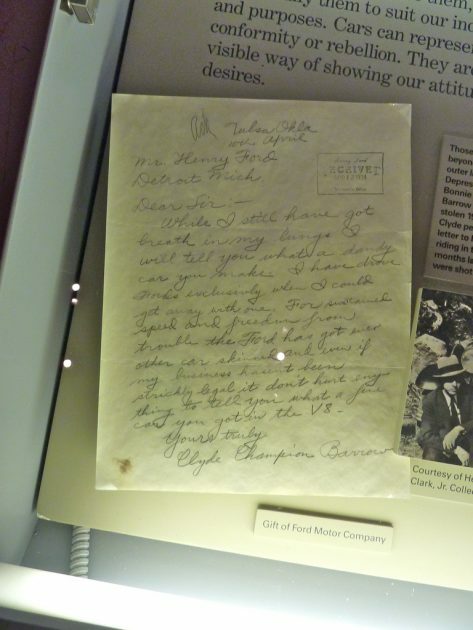 Whether it is truly from Clyde or not, the letter, currently on display at the Henry Ford Museum, remains an attraction today (though not as enticing as their death car). Though not technically part of the musical, some Bonnie and Clyde songs are really popular that it’d be a shame not to include them here. Georgie Fame & The Blue Flames recorded “The Ballad of Bonnie & Clyde” after seeing the movie Bonnie and Clyde that depicted the life of this gangster duo. Released in 1967, it reached number one in the UK Singles Chart and number seven in the United States in 1968. This 1920s and 1930s style song is upbeat and bluesy as Fame sings about how Bonnie and Clyde “lived a lot together.” It details the devil’s children’s entire journey, featuring car chases and police sirens, and appropriately captures the nature of their criminal lifestyle before an intense gun battle kills the vibe to bring the song to a melancholic close when “finally together they died” and horns wail. 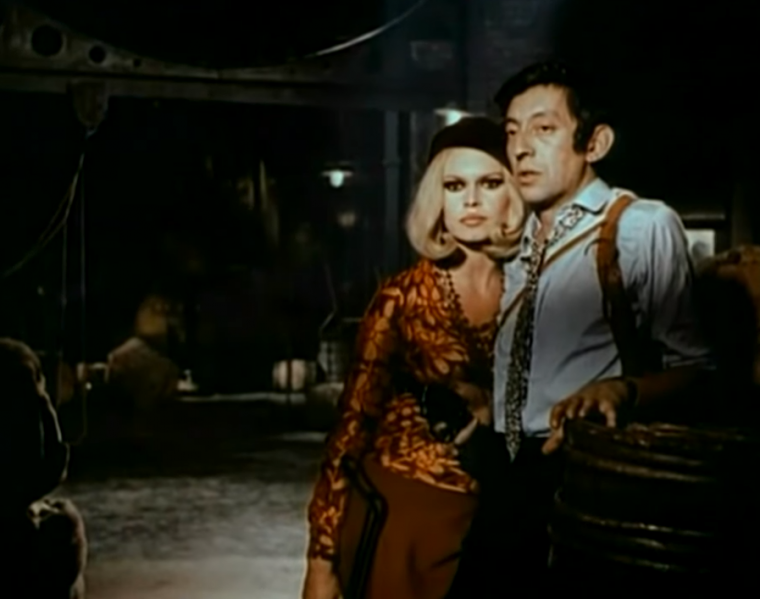 “Bonnie and Clyde” is a French song sang by Serge Gainsbourg & Brigitte Bardot. Gainsbourg wrote it based on Bonnie’s poem entitled “The Trial’s End” written just weeks before her death. This song’s mellow and hypnotic vocals and instruments eerily tell the story of the outlaw couple in French. 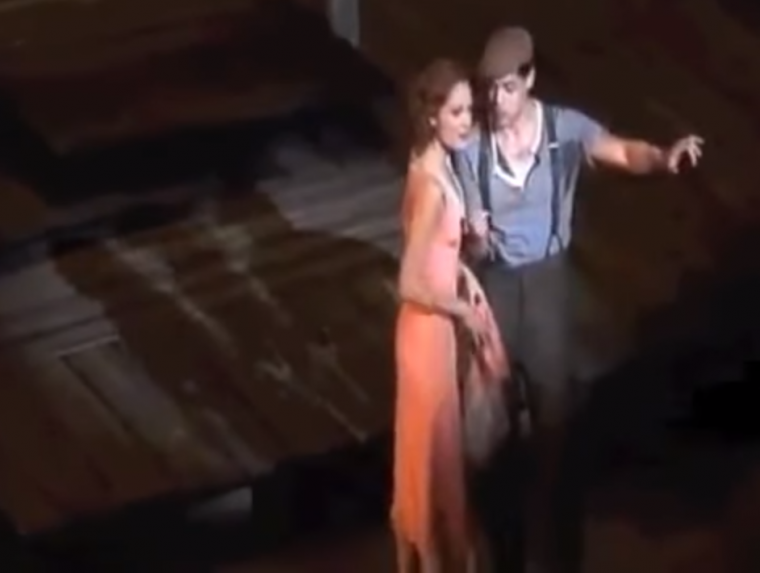 Its tantalizing sound arguably makes it the most popular song about Bonnie and Clyde. Featured in the iconic Rush Hour 3 in the burlesque show scene, girls in pinstripe suits evoke the 1930s era as they wield machine guns and “shoot” at the car, spelling out “Genevieve”, rather than a certain death, in an act that certainly fits the show’s theme as Gainsbourg’s “Bonnie and Clyde” plays in the background. Carter and Lee save Genevieve from an assassination attempt, so at least her fate is looking better than Bonnie’s. After Carter and Lee’s beautiful rendition of “The Closer I Get To You”, the bad guys actually shoot at the car in a scene that is definitely reminiscent of reality. These daring youngsters lived an unimaginable life of crime and stole the attention of America in the Great Depression and ever since. We remember the infamous duo of Bonnie and Clyde as gun-slinging lovers who were actively opposing an uncaring system, overcoming anyone and anything that got in their way. However, despite how tough the media portrayed them to be, everyone has a soft spot, and for Clyde, his soft spot — aside from Bonnie, obviously — is a Ford V8. Now that’s a man with good taste. Join us next time as we continue this road trip through the land of musicals.